The Internet has penetrated virtually every US household and handheld device, with 88.5% (ITU, World Bank, and UN Population Division, 2016) of Americans connected online. Booking travel, purchasing products, and seeking information have never been quicker via consumer-centric websites and mobile applications. If you want something now, you can get it: food (Seamless or Amazon Prime), movies (Google Play or Netflix), ground travel (Uber or Lyft), etc. So, how do you find out what people really want? Through second screen searches. Search is a unique media channel that allows advertisers to capture immediate intent—often prompted from another stimulus (e.g., TV) even before they finish typing (Google Autocomplete). Other digital channels can reach the right audience, just not always at the right time. It’s no wonder search accounted for roughly half ($34B of $70B) of all digital advertising spend in 2016 (AdAge). Advertisers can no longer ignore the growth of digital ads in comparison to TV. PricewaterhouseCoopers predicted US digital ad spend would surpass TV by the end of 2016; according to an early 2017 AdAge report, it already has. Traditional TV sets are another screen among mobile phones, tablets, laptops, and wearable tech. 87% of consumers watch TV sets while simultaneously viewing another screen (Accenture Report, 2015). This raises the question, do TV audio cues become more important syndicated with mobile visual cues? A Google TrueView Brand Lift Study recently revealed that users who see and hear ads experience higher ad recall than those who only see or only hear ads. You have to ask yourself, what channels are your customers listening to and what screens are they watching? It’s often not the same. Traditional TV buying (Live, DVR, and Time-Shifted) was one of the only advertising media outlets to offer such great scale. Now we have online streaming commandeering a large piece of the pie with the likes of Netflix, Amazon Video, and YouTube leading the way. TV watching habits have continually shifted. The time people spend watching YouTube has doubled (2016 to 2017) with additional content casted to TV screens (think with Google). TVs act more like a large computer monitor rather than the sole hub for viewable content. Viewers have not abandoned traditional TV, yet the demographic does skew. The younger the viewer, the less likely they are to watch traditional TV. While traditional TV viewership has decreased over the past 5-years in every age group except 65+, traditional TV is still the dominant choice for viewing (Nielson data, Q3 2016). Due to this, it becomes increasingly more important to understand the demographic of your audience and find them where they are watching content. We hope that a pristine produced TV commercial with the “perfect” timeslot will have customers beating down our doors to buy our products, but that’s seldom the case. Standard TV messages must be reinforced and restated across multiple channels to resonate. People recalled another brand: A handful of people recalled another brand instead of Volkswagen, the brand advertised (Internal case study using Sysomos, 2012). People didn’t recognize the brand, only the features in the commercial: A handful of people recalled non-branded features more often than the brand or product name (Honda case study 2012). So how do we keep people on the path to purchase? Use second screen advertising, organic and paid. Capture existing interest from TV efforts through branded and category-specific second screen searches related to commercial features. Make sure you purchase the commercial-related brand and product queries so the consumer can associate your product with your brand and vice versa. Setup positional rules to make sure related ads are in position 1 at all times throughout TV ad support. Make sure you purchase category, commercial-themed keywords that people are likely to search. If the consumer forgot your brand or product, this is the perfect way to remind them. Use a focus group or Google Surveys to determine what keywords consumers will likely search in relation to your TV ad. If running coupons, or similar promotions, use localized keywords and ad copy. Utilize Google Scripts to align ads with your TV schedule and amplify bids. You can do this through uploading data and recalling that data within your script (read more on connecting Google Sheets and AdWords and Google AdWords Scripts). Customize your ad copy for each TV ad variation. You may find purchasing relatively broad keywords expensive. By activating these keywords while your TV ad is active, your ad CTR and relevance will be higher. This will allocate budget at the moments of greatest impact. Volvo invested $0 dollars in TV, instead, they hosted an online competition and supported it with digital channels. All the user had to do was Tweet #VolvoContest whenever a competitor’s TV commercial showed up for a chance to win a car. Through additional search support, the competition had findability and success (2015 Cannes Lion Awards). This is a big NO. It’s common in search and user-experience-design that the simplest language and the smallest number of steps will best aid customers. Consumers search for “google” more often than simply typing in the URL “google.com”. With Google Autocomplete, people even searched “You” more often than “YouTube” and let Google do the work for them. Customers or viewers seldom remember or want to type in long URLs—especially when they quickly flash across the TV screen. There’s enough clutter throughout the day, with ads at the bottom of the pile. Instead of advertising URLs, use a tagline or call out specific to that campaign and capture consumers when they search related queries. Save your money and test variations of ads on YouTube with a small audience to assess resonance before launching TV efforts. This will also help you understand how people may find your video—the search terms likely to be used. Measure your results via Google Brand Lift Study (or other means), analytics, and/or related search volume to discover the impact of your ads. The outcome will help determine the best channel mix and investment. Don’t assume something is working well. Understand the impact one channel has on the next. We often credit one source when credit should go to another. Use impression trackers and explicit TV ad-related keywords, unique coupons, and call-outs to help measure attribution. Invest in the unknown. Plan to use a portion of your budget on new technologies and/or strategies. 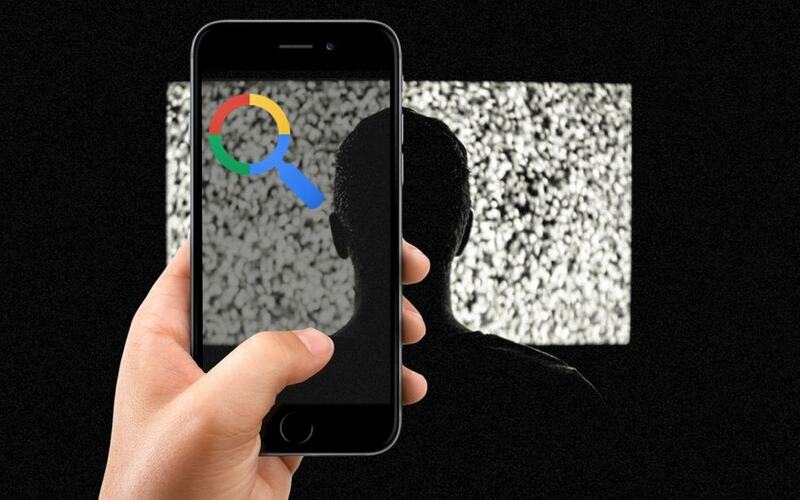 So Why Use Second Screen Searches to Capture TV Watchers? We know digital ad spend exceeds TV ad spend in 2017—and is still growing. Search is a significant chunk of digital spend. We also know that viewers—your customers—are on their phones while watching TV. Search captures that audience in their exact time of need. If TV is the stimulus to prompt a purchase, then search is the net to capture TV watchers at the right time. But, not only is it the net, it’s also the tour guide to make sure TV watchers navigate to the right brand and product. Without it, competitors can take advantage of any advertising faults and users may abandon their purchase journey. Don’t lose sales you should have never lost. Always use second screen advertising to capture TV watchers.